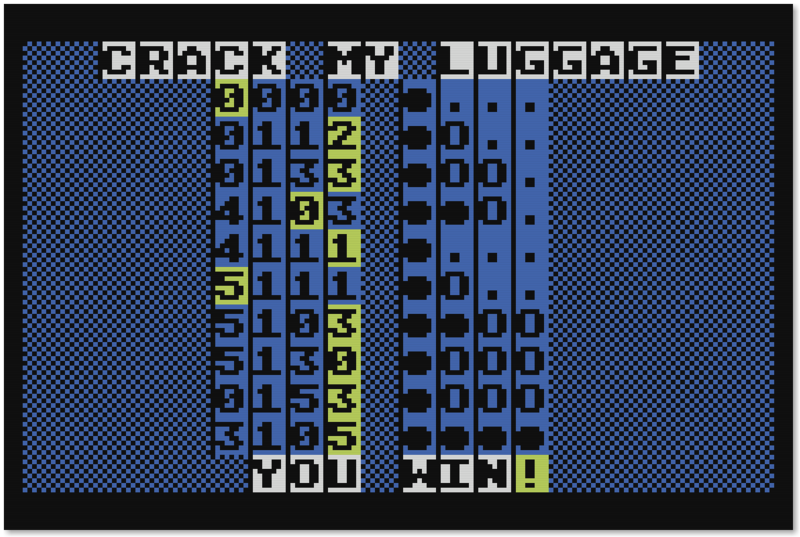 Silly me, I've lost the code to my luggage and I'll need you to try to crack it so I can get to my stuff! Although I can't remember the code, I think it will look familiar as you guess. After you guess, I'll tell you how many numbers are right and are in the correct place with the dark pegs to the right of the code. Correct numbers but in the wrong place will be Os. Order of the pegs have no relationship to the code. You'll need a joystick plugged into joystick 1. After the game starts, the screen will be blank for a few moments before show you the game board. Use up or down on the joystick to select different numbers, and the fire button to submit your guess. The game is over when you correctly guess the code or have more than 10 tries. Pressing the fire button will start the game over. A self contained disk image is available, CrackMyLuggage.atr.